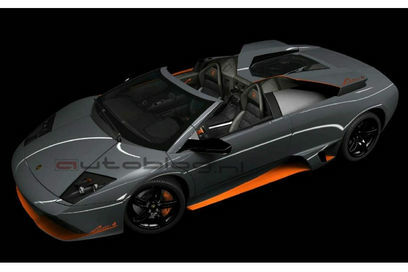 Ahead of next months Geneva Motor Show, Someone at Lambo has decided to ‘leak’ a few details of the new Lamborghini LP650-4. It is touted as the fastest open topped car Lamborghini has ever produced and with just 50 being sold it will also be one of the most exclusive. Stats suggest a top speed of over 205mph and power is rumored to come from the Reventon’s (Released at last year’s Geneva Motor Show) 6.5-litre, V12 engine, running at 650bhp and using the same e-gear automatic gearbox. As you can see the car will be kitted out in a special black and orange colour scheme, both internally and ex. Autoblog / AE for pics! Props!